There are several reasons why a foundation can deteriorate. Some are from moving equipment and heavy traffic on the inside of a building, and some are from the outside of the building due to the environment in which it is located. Sometimes the foundation is actively moving or a settlement is occurring. This is a condition that requires monitoring so evidence of more movement can be detected. Naturally occurring events and disasters can cause the concrete foundation to deteriorate. If you use forklifts and other heavy duty machinery, the movement across the floor, over time, will cause deterioration. What Products Can Repair Concrete? • Kwik-Bond – This resin-based compound is high strength that is used to bond all surfaces. It is able to applied to damp surfaces and is flexible for patching and resurfacing. It’s also USDA approved to use in meat and poultry plants. 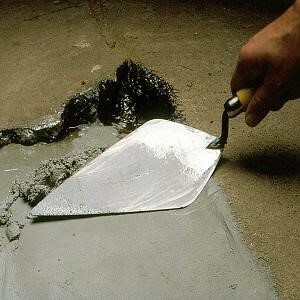 • Kwik-Crete – This is a rapid setting, high industrial strength concrete repair product. Its design is meant for spalls in concrete floors, surfaces, and cracks, as well as to rebuild control joints that are damaged very quickly. • Repox-Mix – This epoxy mortar is high strength and used under extreme conditions. It can bond to damp surfaces and can be used outdoors. • Polyflex – is used as a concrete crack filler and sealer, designed for narrow masonry grooves and expansion joints. It is flexible and self leveling, reinforces the joint, which prevents deterioration of the edges. • Kwik-Flex – This is a material used for low temperature areas as a complete expansion joint and crack repair product. It can also be used wherever you need a quick set since it creates a lasting seal in only 60 minutes. • Repox FC – This advanced formula is an 8 hour application that provides a heavy duty gloss finish to floors. The surface of a poured slab of concrete may require sealing to help control the entry of random gasses or water. It is best to get an assessment of the damaged concrete and fix it immediately. If the deterioration isn’t fixed right away, the damage could become worse and costly. If you need help selecting a concrete floor repair product, contact us to tell us about your concrete damage and we will help you select the right product.